Logic Oral Hygiene Gel can be used as a toothpaste or even added to food. It is intended for use in dogs and cats and is most effective if applied with a soft brush and applied gently over the surface of the teeth, paying particular attention to the junction between the tooth and the gum. 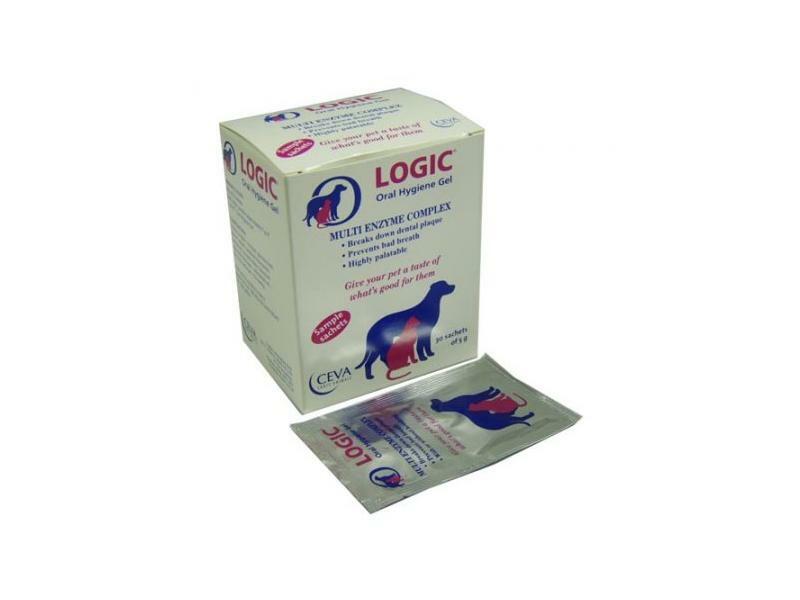 In some pets this can be very difficult and Logic Gel benefits dogs and cats if just placed in the mouth, or even added to food. The simple action of the tongue and cheeks will tend to distribute it over the surface of the teeth. It contains enzymes and a mild abrasive which help to break down plaque and along with the action of chewing, the teeth can be left cleaner. Most animals enjoy the taste and happily accept it being placed in the mouth. Ideally it should be used every day. first of all I wanted to thank you for how quickly my item was dispatched. I just thought I should let you know how FANTASTIC this product is! I have 2 cats, Poppy 5 & Cornelious 9 who I use this product on daily. Cornelious has already been to the vets to have his teeth cleaned while under anesthetic, not ideal as you will know. He was getting ready to be done again when my husband saw a reveiw on the "money saving" website, a lady was raving about it so we gave it a go! I put a small amount on my finger, Poppy will just lick it off herself but Cornelious being a boy (& more stubborn) has it rubbed on his teeth. I saw a difference in 2 weeks! the thick build-up of tartar on the back teeth was just dissapearing, like magic. I have just ordered my 2nd tube & can honestly say that my cats teeth are whiter & their gums, healthier! you may think that it's expensive for a toothpaste, but it is so much much more than that. firstly - no messing about with a toothbrush, which neither me or my cats enjoyed. secondly - what's the alternative? general anesthetic which your cat may not wake-up from & is expensive. well, thanks for an EXCELLENT product & I will buy it as long as I own cats. Below are some recent questions we've received regarding Logic Oral Hygiene Gel, including answers from our team. Could you please tell me if the logic toothpaste contains any fat. My dog is prone to pancreatis so i have to be careful. Thanks. Having spoken to the manufacturers, I can confirm that this product does not contain fat. my dog is on completely hypoallergenic food (hills zd) as he is v itchy otherwise. Would this product be suitable? This product does contain some protein so it is vaguely possible that your dog could be allergic to one of those. You should for a while give z/d and nothing but water and make sure that your dog shows no signs of trouble at all. Then after a week or two with no symptoms, you can add something of very low risk and see what happens. This would be a suitable product to add at that time, to test if it is OK. You will soon know if you have to stop it again, or can continue with it. Most people with dogs on z/d do in fact identify a few other things which it is safe to give (often different foods in fact) but only trial and error will show this. Are all the ingredients safe for dogs? I know that some toothpastes contain xylitol which is not good for them. This product is intended primarily for dogs and is indeed very safe for them. When used as directed it is not a problem at all. My 14 year old dog is Diabetic on insulin twice a day, would it be suitable in this case. I would not expect the use of Logic to affect the treatment of diabetes, unless there is also a change in feeding/exercise etc. It should be suitable for your dog. What are the ingredients in this product? In all the dog dental products. The logic products all contain a patented enzyme complex which does appear to break down much of the accumulation on the teeth of dogs and cats. There is also a surfactant present to help distribute them over the teeth and improve surface contact, as well as mild abrasives. The enzymes are: amylase, glucoamylase, glucose oxidase, potassium thiocyanate, lactoferrine, lactoperoxidase, lysozyme, superoxide dismutase. The 2 reviews mention giving to cats but is it also suitable for dogs? Yes this product is suitable for both dogs and cats. How much of the gel do you use and how often? You don't need to use to much paste, basically just as you would yourself, put enough to cover the brushes on the toothbrush. If you can manage daily that would be ideal, but otherwise as often as is possible.